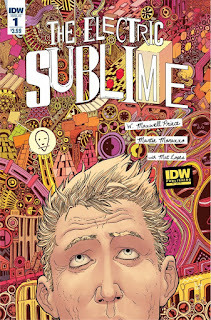 The Fellowship was fortunate enough to obtain a copy of THE ELECTRIC SUBLIME #1 from IDW Publishing. W. Maxwell Prince writes, Martin Morazzo draws, Mat Lopes colors, and Good Old Neon letters. The end of this issue gives us a glimpse of what that term means, and the idea turns what little we know about Arthur on its head. Margot (the BAI director) is about to get a crash course in Arthur’s psychology (and maybe a few other things). The twist is quite a shocker, even after being set up perfectly. And the story so far is compelling, while the art does a very nice job of establishing a world just slightly different from our own. I’m a fan of weird fiction, and this first issue sets up a weird story very well, with lots of questions and not much concern for answers. I know I like it that way, and I think you might too. THE ELECTRIC SUBLIME #1 is available now at your FLCS or at idwpublishing.com.